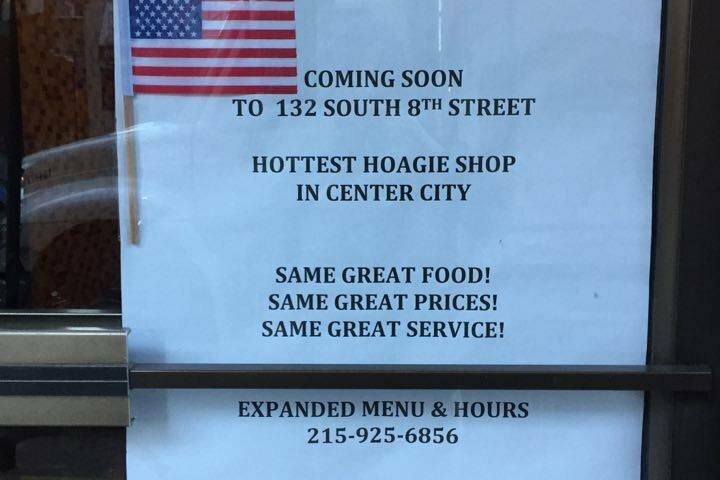 This sign promising a new hoagie shop at 132 S. Eighth St. was posted after the Fink's Hoagies shop that previously occupied the space permanently closed. Fink's Hoagies' Jewelers Row location will not reopen after its owner was unable to find workers who met his standards. But a new hoagie joint will take its place. 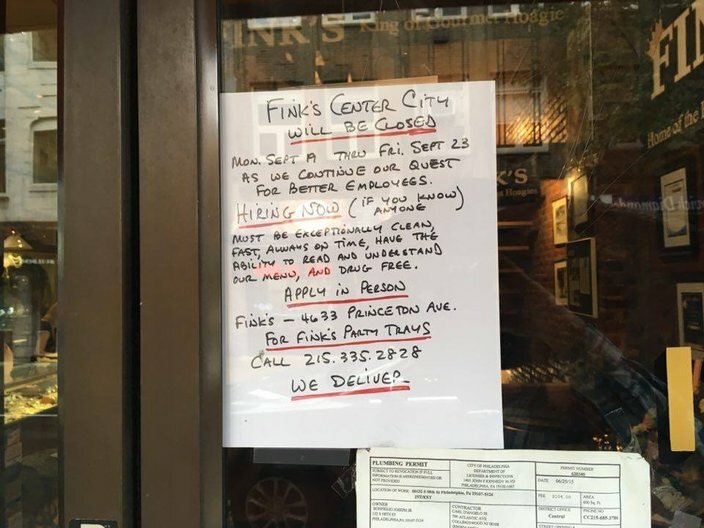 In September, PhillyVoice first reported that Fink's had temporarily closed its shop at 132 S. Eighth St. in order to find "better" employees. "We had a group that wasn't up to our standard and we had to clean it up a bit," Eric Fink, son of owner Dennis Fink, said at the time. "We're training a new crew now and we're hoping to ... reopen as soon as possible." Apparently, that didn't work out. Fink's, which also has a location in Northeast Philadelphia, has permanently closed its Jewelers Row location, according to Philly.com. "After reviewing numerous applications during the past four weeks, this issue still prevails. Unfortunately, I cannot clone myself and be at both Fink’s locations at the same time." Fink added that his name and his reputation with his customers are "paramount" to him, and that he was proud of the success of the "hidden" location in the little over a year that it was located there. Replacing Fink's at the location will be a new hoagie shop, according to a sign posted on the door as of Tuesday morning. The sign advertises the incoming shop as the "hottest" location in Center City and promises the same "great" food, prices and service as Fink's. A woman who answered the phone at the number listed on the sign said American Jewelry Company, which sits inside the same building and was the landlord for Fink's, would be leasing out to a new hoagie store but could not disclose further details. The Eighth Street Fink's shop opened in June 2015. The location abruptly closed last month for a search to "find better employees." The sign said the store was looking for staffers who were "drug-free" and could "read and understand our menu." This sign was posted on the door of Fink's Hoagies on Jewelers Row on Monday, Sept. 19. According to the sign, the location will be closed until the eatery can find 'better' employees. Dennis Fink told Philly.com that one worker had been asked to leave and another left without notice on a Friday afternoon, causing the initial staffing issue.